Securely situated within the most exclusive residential estate in Westville, this 720sqm architecturally designed home is grand in size and full of charm and grace. With its symmetrical composition, multi-pane windows and classical details, this Georgian style masterpiece is a true celebration of the elegance and sophistication of this bygone era. 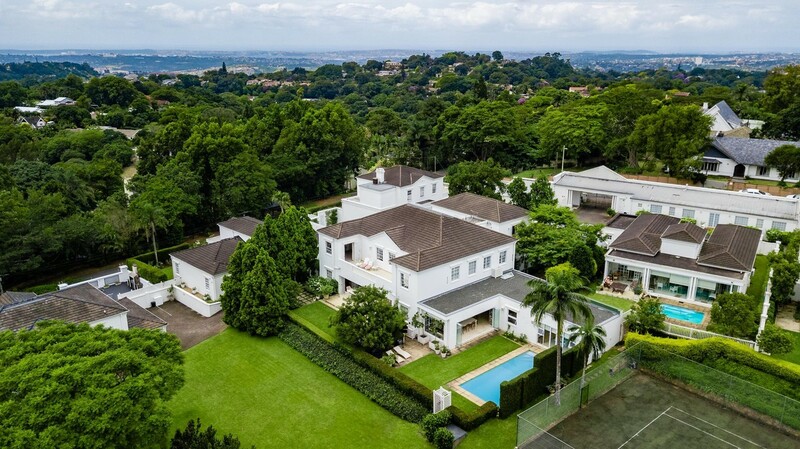 Conveniently located in the heart of Westville, and zoned for all central Westville schools, Elton Manor is a highly sought-after estate that offers residents an unmatched level of privacy and security. The communal grounds include flat, well-manicured lawns and a tennis court for both the young and old to enjoy. However, security is one of Elton Manor's most important features. The estate is fully walled and includes electric fencing, access controlled gates, and street patrolling security guards. With the potential for four separate dwellings, this well-appointed home features six spacious bedrooms, five and a half bathrooms, four lounges, two dining rooms, two studies, library, modern kitchen with separate scullery, covered entertainment patio, double garage, drying room, private courtyard, manicured gardens, swimming pool and a separate self-contained flatlet. The charm of this home lies not only in its sheer size but also in its details. From the front formal garden with its trimmed hedges, pergolas and ornate wrought-iron gate, a gravelled pathway leads you to a secluded courtyard that is shaded by tall Leopard trees. The double front doors then open to reveal a double-volume entrance hall that makes a grand statement and welcomes you into the home. The entrance hall leads you into the open-plan living room, which includes a formal lounge and dining room, and boasts lofty ceilings, downlighting and fully recessed glass sliding doors that open onto the covered patio - creating a seamless indoor/outdoor living space. Overlooking the flat manicured lawns, with unobstructed treetop views that stretch all the way to the sea, the covered patio has space for both an outdoor lounge and dining area and offers the perfect place to entertain guests and host lavish outdoor dinner parties. Off the main living room, you will find a separate Tv lounge and two studies. The largest study is private and features a built-in desk with filing cabinets and a storeroom that would make the perfect cellar for your wine collection. Positioned in the heart of the home, the large L-shaped kitchen is beautifully designed with great attention to both detail and functionality. Boasting simple yet sophisticated finishes and features, the kitchen comes complete with granite countertops, white solid wood cabinetry, breakfast bar, glass window display shelf, prep bowl, double eye-level oven, five burner gas stove, space for two fridges, a walk-in pantry and a separate scullery/laundry room. Off the kitchen and the open plan living room, you will find an additional lounge, dining room and bathroom, which could easily be converted into a separate studio apartment or used as a home office, guest suite or teen pad. Upstairs, with french parquet flooring throughout, you will find an open library with floor to ceiling bookshelves and several doorways that lead off to the six spacious bedrooms and four stylish bathrooms. The Master Bedroom is a large, elegant space that is light and bright and boasts high ceilings, a walk-in dresser, and a private balcony with breathtaking views. The Master ensuite bathroom oozes luxury and includes Travertine tiling, shower, double vanity and a large picture window over the bath. Off a separate wing of the house, you will find two bedrooms with an inter-leading bathroom, and a large open plan living room with a contemporary kitchenette and french doors that lead out to a private balcony with a wheelchair ramp to the driveway - offering the potential of a separate two bedroom apartment for friends or family to enjoy peace and privacy when they come to visit.